As unlikely as this sounds, I have hobbies besides enjoying beer. Specifically, I really like reading. So it was like Liberty Street Brewing Company read my mind when they hooked up with the Plymouth District Library to host Books On Tap. The event takes place every other third Thursday of the month. 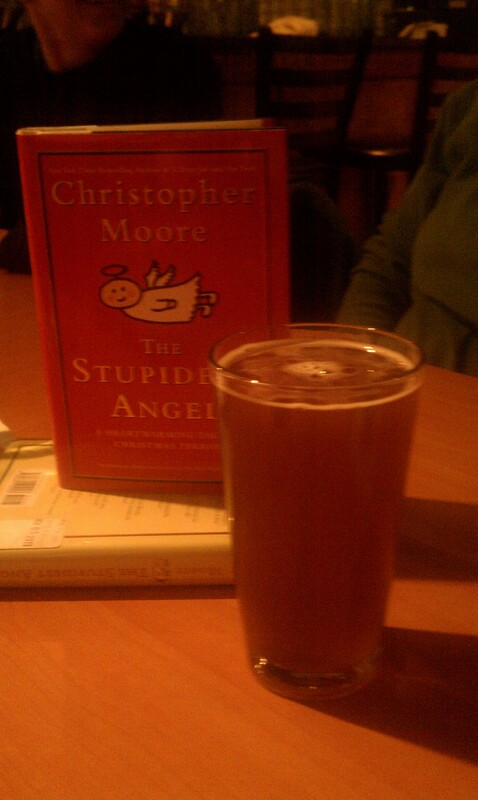 This past month, the book was called “The Stupidest Angel” and it was written by Christopher Moore. (Note please that I am stealing the following synopsis from my fellow book clubbers; I never made it past the third chapter. Didn’t like the book. At all.) The book was about a child who witnesses the murder of a man dressed as Santa. An angel is sent to earth to grant a child a wish and our angel decides upon this boy. But, because the angel is stupid (get it?) he somehow ends up flooding the town with zombies. Yeah whatever. But what about the beer? Well, luckily for me, Punkin’ Pie Ale was still on tap! If you did not get to enjoy this delicious ale, run down there and see if it’s still available. If not, I’m afraid you will have to wait until next fall. This amber ale tastes like pumpkin pie. Not lying. It tastes like pumpkin pie. It’s ABV is a healthy 5.3% so you can drink more than one, but maybe not more than four. Don’t be sad if you missed this month’s event, as it will happen again on February 23. The book is “Honored Guest,” by Joy Williams. The Punkin’ Pie Ale will surely be gone by then, but one thing is sure—there will be books—and beer—on tap! Next What Beer Goes Better With a Cold?